Fire and Fury, Michael Wolff’s inside account of Donald Trump’s first nine months as US president, is so incendiary it’s become a publishing phenomenon. 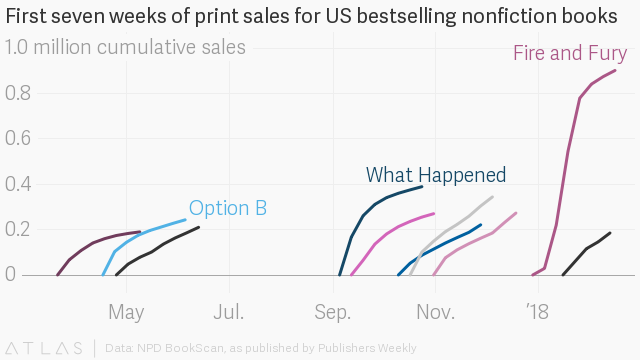 Quartz compared the 10 bestselling nonfiction books from the last 12 months, using sales numbers from each book’s first seven weeks in publication. We used point-of-sales data from NPD BookScan, which covers an estimated 85% of the US print book market. The data show clearly that Fire and Fury blows all other nonfiction out of the water, not only in raw number of books sold but also in how rapidly its sales grew. The Pioneer Woman Cooks: Come and Get It! : Simple, Scrumptious Recipes for Crazy Busy Lives, by Ree Drummond (Oct.